Your company website is the online face of your business. It is the first thing people see when they encounter your business after doing a search for the services or products you offer. Business success is all about first impressions and your website is at the forefront. It is the first impression visitors will get of the way you handle business, the way you handle customer service and the quality of your product or service. Your website can communicate many things to a visitor and that is why it should be a top priority in your digital marketing strategy. You may think that if you already have a website you’re on the right track. That is true. Having a website is the first step to generating leads from the web. 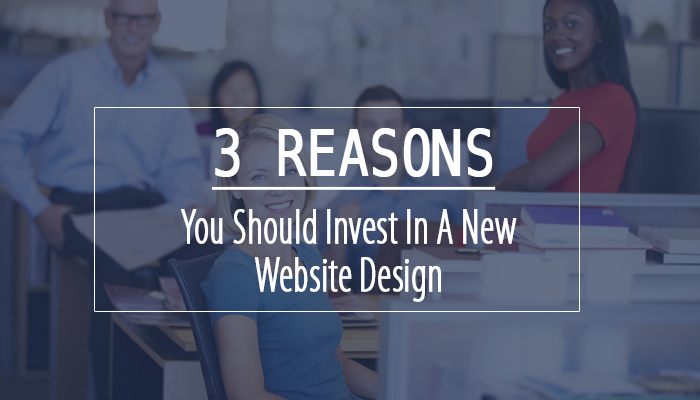 However, here are a few reasons why you should consider investing in a new website design. Your website is dated and does NOT accommodate mobile visitors. It is very important to stay up to date with the latest technology in digital marketing so that your website will remain relevant and searchable. Handheld devices have usurped laptop and desktop usage. Consequently, in recent years, mobile responsiveness has become integral in online marketing. In fact, Google’s search engine algorithm now penalizes websites that are not mobile responsive. If your website is not easily viewable on mobile devices such as personal tablets and cell phones, your visitors are forced to zoom in, scroll, and pan in order to read your content. This is cumbersome and makes it difficult to navigate and find the content they are searching for. Unfortunately, this can deter the visitor away from your site. In an effort to promote high-quality sites in search results, Google has begun to prioritize websites that incorporate mobile responsive technology that allows websites to automatically reformat for easy reading on any type of device. A major reason to invest in a new website design is to maximize the benefits of a mobile responsive website in order to bring in more leads for your business. A website is a great tool that can work around the clock for you. It’s like having an online concierge constantly funneling potential customers or clients your way. The main purpose of a website is to produce leads. Your website should be attracting prospects and generating targeted leads for you to follow up on. If you’re not getting that kind of support from your website, something is wrong. A well-designed website attracts search engine traffic daily, answers frequent questions, and convinces your ideal patron to become a qualified lead. Believe it or not, the design of your website plays a huge role in accomplishing these objectives. Smart utilization of your brand language, niche-driven navigation menus, and well-placed opt-ins are just a few of the website design tactics we use to help drive leads and sales for your business. We live in a social media-driven society. Our lives are journaled on social media platforms and that’s how we connect with each other as friends, families, acquaintances, and strangers. Buying decisions are highly influenced by what other people are saying about a particular brand. Testimonials and customer experiences are cataloged across the web on multiple platforms such as Facebook, Twitter, Yelp, and Google. Your website should demonstrate positive connectivity with your patrons on all of these platforms by linking to various social media channels. These testimonials ‘prove’ that your brand is invaluable to your patrons. A good website design strategically displays social proof throughout your website. Your website is often times your first opportunity to make a positive impression with a potential customer. Studies have shown that website visitors make a choice to stay or leave within the first few seconds of entry. Therefore, it is vital to ensure the best design possible for your website. Make it a priority to create a modernized experience for your visitors. It could mean the difference between a new customer or a lost opportunity.